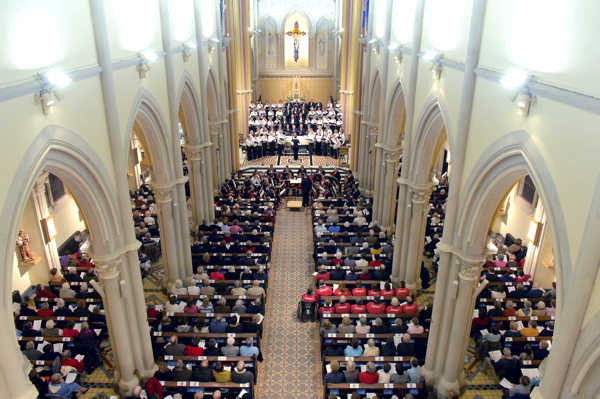 Wednesday 17th December was the date set for our Festival of Carols in 2008 which took place at the beautifully refurbished St. Thomas' Roman Catholic Church. In a church which was even more packed than usual, with people filling even the areas behind the altar and the singers, where they were still content only to hear and not to see what was going on, the spirit of Christmas was celebrated with beauty, stillness and gusto. 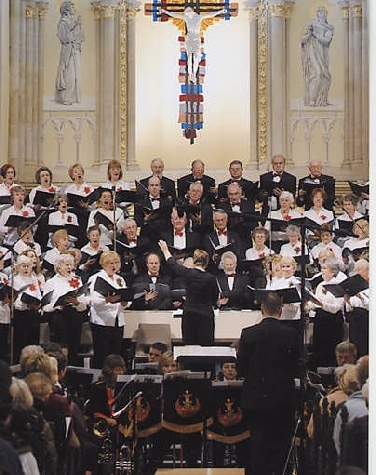 Premier Brass, under the driving baton of Tim Pritchard set the scene with a rousing fanfare, as His Excellency the Lieutenant Governor, the the Choir’s Patron, Lieutenant-General Andrew Ridgeway, Mrs. Ridgeway and his party entered the Church (seen below singing in the congregation). This was followed by the unaccompanied Festival Choir introducing the choral element of the Festival with a gently rendered invitation “This is the truth sent from above”. 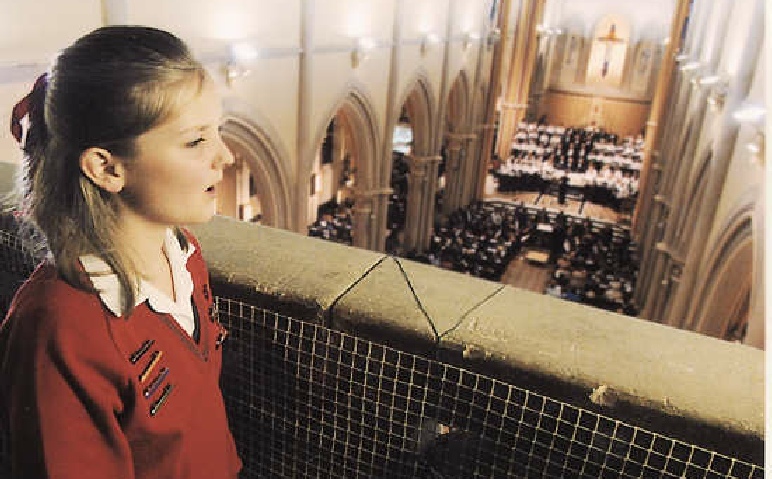 A young soprano voice then lilted down from the organ loft with the happily traditional first verse of “Once in Royal David’s City”. The service could not have taken place without Malcolm Whittell’s twinkling fingers on the organ – with a magnificent solo at the centre. The Brass were especially tumultuous in their solo spot, which one listener felt might well raise the newly decorated and flood-lit roof –“I just sat back with eyes closed and let the music thrill through me” he said! There were new and familiar carols by the Holmchase Choir, conducted by Angela Vautier, who had nobly risen from her sick bed for the service, and thanks are due to her and her lovely singers for adding their usual but intensely musical voices to the occasion. Elizabeth Farnon, the new Choir Mistress, excelled herself with the Festival Choir, giving everyone an uplifting sense of joy with the rhythmical Spanish Carol “Riu, riu Chiu”, which her husband John led with his word-perfect Spanish solo verses. She deserves our special thanks for continuing the Lobb family tradition and giving so many lovers of this service yet another exhilarating experience. Both Choirs and all the musicians combined for the climax of the service which is always, and unforgettably, “Minuit Chretiens” – where the plangent solo guitar played by Sue De Gruchy, leads them all into the great cry “Fall on your knees” – a truly appropriate note to end on for Christmas and its wonder. Paul Patterson’ moving, and yet amusing, Appeal for the Jersey Sports Association for the Disabled raised, in the subsequent Collection, the generous sum of £3,187 – warm thanks to the Congregation for this.. The service ended with a Blessing by Monsignor Nicholas France, who deserved everyone’s particular thanks for allowing his magnificent and superbly restored church to be used for this annual celebration. All those present were immensely grateful. 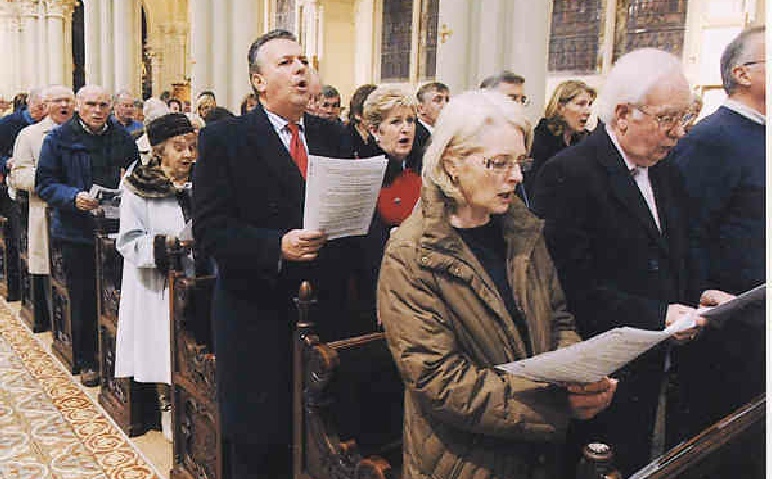 The Service was broadcast on Christmas Day at 6.00pm on BBC Radio Jersey – our thanks to them for recording it and to the Jersey Evening Post for their support in publicity and photographs before and after the event.